The first ReIReS Course on digital humanities and religious studies was full of information, challenges, tasks, feedback and tools. 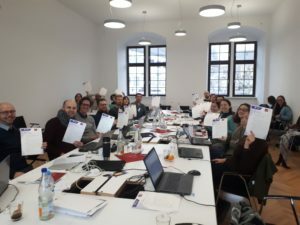 “I learned useful tools which lead to faster results and make history more ‘touchable’, like working with historical maps”, thus one of the participants of the first ReIReS DH course that was organized by the Leibniz-Institute for European History in Mainz and held January 21-23, 2019. Some 30 participants from all over Europe got a deeper insight into tools like Cosmotool, DARIAH-DE, RETOPEA, Omeka, Oxygen and TRACER for their own research. They were not only told what is possible, but they were also shown how to use these tools, and finally there was a lot of time for practice under the excellent guidance of the experts of the institute in Mainz. The feedback of the trainers played an important part in the learning process of the participants. The course has definitely shown the importance of digital humanities for the study of religion in Europe, and of training a new generation of scholars. These are but a few of the reasons why ReIReS will continue offering these kind of courses. The next DH course will take place in Bologna, July 3-5, 2019. Application is now open: read more here.